Please note that our Asparagus crowns are only despatched between April and May as this is the best time to plant crowns. Plant spacing can be either: 1 m (40”) between rows planted 30 cm (12”) apart or 90 cm (36”) between rows planted 45 cm (18”) apart. Selecting a site - It is essential to choose a site with uniform soil conditions and good drainage, as asparagus is a long-term crop that can last up to 20 years. Early asparagus spears can be damaged by frost so frosty sites must be avoided. Though asparagus can be grown in many soil types they have extensive root systems and therefore, for maximum development, the ideal site should be a deep dug, rich free draining soil. Soil Preparation - It is important that the soil is totally free of perennial weeds prior to planting, as weeding will become difficult once the growth has developed. In the autumn, prior to spring planting, incorporate a good quality farmyard manure. If you are planting a large area with asparagus it is advisable to carry out pH and nutrient tests to ensure that the pH is between the ideal 6.5 and 7 (add lime if necessary) and that there is a balanced nutrient level present. For smaller areas within the ideal pH of 6.5 and 7 an annual application of a general fertiliser will be adequate. If your soil is heavy either plant in raised beds these should be a minimum 60 cm (2 ft) deep or incorporate clean sharp/horticultural sand, which will improve drainage. 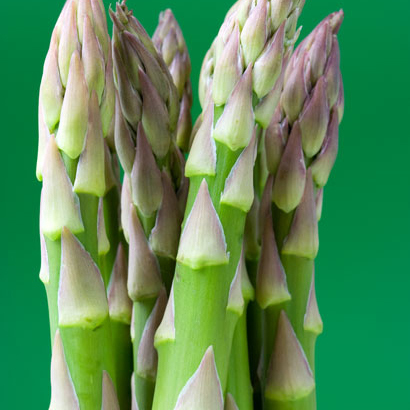 Asparagus crowns are despatched between October and May but are best planted April-May. Please mark your order if you would like delivery before April. 10 Crowns of each 3 varieties. 30 Crowns in total. Crowns are dispatched between October and May but are best planted April-May. Having foolishly arranged to go on holiday in April I got good advice about when I could plant asparagus crowns and when to schedule delivery. A selection of three types arrived and were planted out in late April 2012. I am looking forward to the extended season that will come with the three different cultivars.